As a food blogger, I feel like there's a lot of pressure to be unique and original. There are so many great food blogs out there -- I mean, just take a look at foodgawker and Tastespotting -- how are we supposed to distinguish ourselves from one another? The Hummingbird Bakery Cookbook offers an easy, uncomplicated, one bowl recipe that I always turn to when I'm craving a no-fuss brownie. All it takes is one bowl, 10 minutes of prep time, and another 30 minutes in the oven. 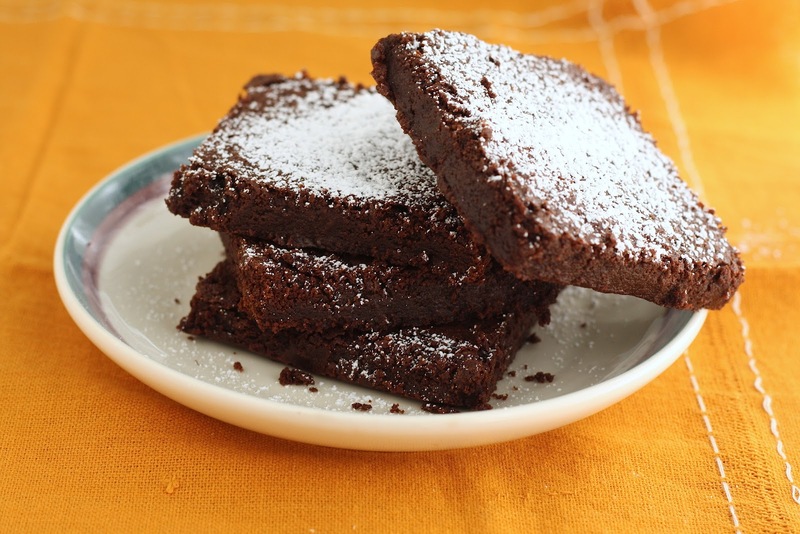 The brownies the recipe produces are chewy, chocolatey, and dense with a flakey, papery top. Made with simple ingredients, an easy recipe, and hardly any cleanup to boot. Since brownies are one of my favorite baked goods, I've experimented with different recipes and varieties in the past -- but really, nothing beats this traditional, classic recipe. It's been a busy few weeks -- between things ramping up at work, friends visiting, and finding myself gearing up for yet another move -- the days have been long and I find myself exhausted. I love my blog and I love trying new recipes for it, but sometimes, I just want a simple brownie and nothing more. 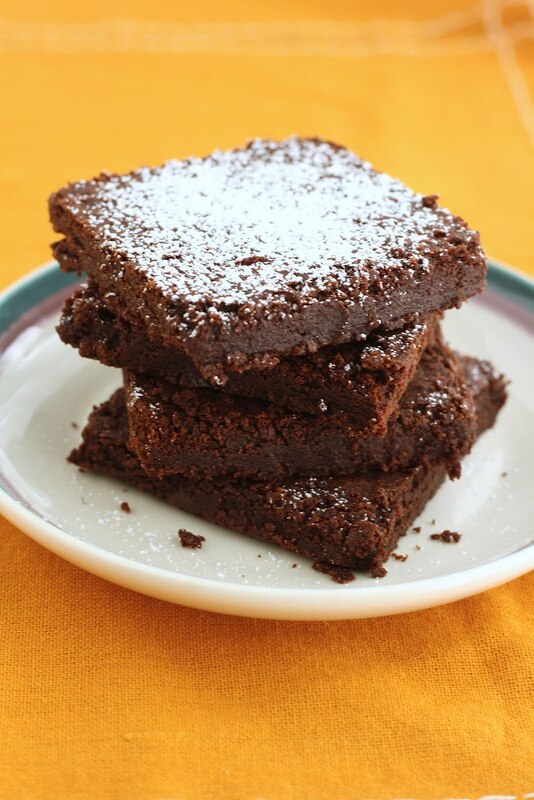 The kind of brownie doesn't need a story because it's just your everyday brownie. And this recipe is exactly that -- delicious, but nothing fussy and nothing pretentious. Why aren't all baked goods (and blog posts) this easy? Put 6 1/2 oz. chocolate and 1 1/2 sticks butter in a large, heatproof, stainless steel bowl over a saucepan of simmering water -- make sure the base of the bowl does not touch the water. Leave until melted and smooth, stirring occasionally. Remove bowl from heat. Add 1 2/3 cups sugar, and use a rubber spatula to stir the sugar into the chocolate and butter mixture until well incorporated. Add 1 cup flour and stir until just incorporated. There should be one or two flour streaks left -- be careful not to overmix, or your brownies will be too tough and I will be sad. Finally, stir in the eggs and mix until just incorporated. The batter should be thick and smooth at this point. Spoon the dough into the prepared baking pan and bake in the preheated oven for about 30-35 minutes, or until flaky on top but still soft in the center. Be careful not to overbake otherwise the edges will become hard and crunchy. Let cool completely on a wire rack before dusting with confectioner’s sugar to decorate. I totally hear you about the pressure of being a food blogger. I feel like my brain is constantly in a tizzy, trying to think of unique recipes, ways to engage readers, etc. I'm glad you "took a breather" by doing a basic recipe. It sure helped me earlier this week!